After the McCall Jet Centre Party on Wednesday the second social highlight of the week was hosted this morning at the Quail Lodge. Sir Michael Kadoorie�s Peninsula Hotel once again was the setting for the festival of food, wine and cars on the perfect trimmed lawn. As usual the weather was rather grey in the beginning when the press was allowed to get in early to have a glimpse on the many different cars in several classes. What was very obvious on first sight was the fact that the focus shifts more and more in the direction of modern supercars rather than exotics, a fact that also can be seen by the amount of unveilings from the different brands to promote their latest toys to a very exclusive and certainly wealthy public regarding the entry fees. As soon as the spectators joined the fun at 10 am the sun also came through the clouds and the rest of the day was fine weather. Since a few years the grounds of the Lodge feature two greens on either side of the road and this year the side stage hosted the class of the �Great Ferraris�. Always one of the most spectacular displays the show spanned cars from the early 166MM Touring Barchetta alongside the Le Mans winning 250 TR from the Kadoorie stable, an original 275 GTB/4 N.A.R.T. Spider, the Pinin Prototype as well as the 500 TRC as seen on the tour to the latest TDF models including a taylor made bare aluminium car. The main field was dominated by three groups of cars, on the one end of the field the 50th anniversary of the Lamborghini Islero and Espada was celebrated with a long line-up of the two types, on the other end again the Pagani cars were parked around the booth of the Italian manufacturer. Another of the smaller exotic brands was celebrated with the RUF reunion featuring several cars for the Bavarian manufacturer that creates his small series models on base of the Porsche 911, long before the Singer made the tuning of the older models so popular. Although RUF does not built as many cars as one might think the clientel is a very exclusive one and the names on the badges in front of the cars reads like a who is who of the collectors scene including a bunch of Ferrari 250 GTO owners. But certainly the 70th anniversary of Porsche was celebrated in style as well. Being one of the sponsors of the Quail Motorsport Gathering the marque from Zuffenhausen set up again their own centre on the other side of the road and visitors were welcomed on the outside with a 956 as well as a 919 Hybrid just to find inside the actual 1971 Le Mans winning 917K promoting the upcoming Rennsport Reunion. On the main field the No.1 spider faced the latest electro Porsche with many 356 on the field. One of the highlights without doubt this year was the line-up of 6 Martini Lancia as seen earlier this year in Amelia Island. Making their way from Jacksonville to California the Beta Monte Carlo won its class that also featured a duo of Stratos as well as the Best of Show winning Aurelia PF200C from the late Robert M. Lee collection. But certainly for many of the visitors the cars were only decoration for a day with friends enjoying food from 5 different countries represented by the major hotels from the Peninsula Group ranging from Italian food to the tastes of Bangkok or China. The visitor numbers were highly increased this year and sources mention even double the amount of tickets were sold and judging from the crowd on the field this might be even true. After the announcement of the Best of Show award and its positioning in the Rolex Circle of Champions the show ended in typical American style with a fast disappearance of both the visitors and the cars and while the last cars were still standing on the green the workers started to tear down the tents. While Bonhams had their day sale at the same time nearby after the Quail it was time to head over to the Pebble Beach grounds for the Gooding Auction. The guests and bidders were welcomed by the recently sold Ferrari 250 GTO as brokered by Gooding and the American Auction house could not help themselves but making a hint towards their Canadian colleagues from RM Sotheby´s mentioning a �Series 1 GTO parking only� sign. In the auction room itself the mood was very good as Charlie Ross again entertained the audience with his episodes and stories, especially when his wife was involved in the telephone bidding. The tension was building up until the star lot of the evening crossed the block with the Duesenberg Model SSJ from the Revs Institute came up for sale. The car originally owned by Clark Gable is only one of two cars built to this specification and certainly the once-in-a-lifetime opportunity to acquire one of them. After several minutes of hefty bidding involving several parties the hammer came down at a record sale of 20 million dollars marking the highest sale ever for an American car on auction. 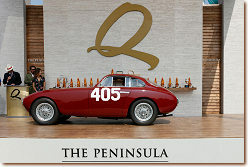 The applause was only topped by the moment the Admirals Ferrari was driven up the stage by his long time custodian himself as Robert Phillips said farewell to his famous Mondial after no less than 58 years of ownership. Overall Gooding did really well this evening in overall but one did see that the times of sales over 95% of the lots might be over and although the records are still coming there are also a few cars as the Ferrari 275 GTB/C did not meet the reserve. Tomorrow will be the second day of the Gooding and the RM sale and after both auction houses having sold a lot at about 20 million $ each the Saturday will feature the sale of the 250 GTO at RM that brought a lot of publicity during the last weeks.